The impact of sound on a film should never be underestimated. Often clever and appropriate use of sound effects can really sell a shot, help with continuity and make visual effects come to life. For Ambleton Delight, it was initially mixed using Logic on a MacBook. The final mix took place using Adobe Audition 3 on a PC (to create a 5.1 mix which we will detail in a later blog). A wild track is an audio recording made at the time of filming, normally when on location, of background sound and atmospheric noises when the cameras are not rolling. Whenever possible we recorded room tones and exterior sounds. These are incredibly valuable to help match shots in the edit or to cover holes in the audio. On one occasion we recorded the different sounds of the village councillors....grumbling, happy, complaining, applauding etc that we could then use when appropriate in the edit. 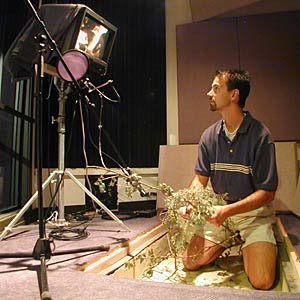 Foley is the art of recording live sound effects during post, like shoes on a pavement or a door closing, to match the film. In our case we recorded a number of foley effects during the post-production stage. For example I was used by Colin Bradley, the sound engineer, to cut vegetables and make all sorts of banging sounds in his kitchen for use in the film. You should now have dialogue, foley, room tones/wildtracks, other audio (radio/piano/CD player/TV) and score. Some effects may need further work -such as adding reverb or tweaking of treble and bass etc. Once ready you need to mix these altogether ensuring that the levels are correct and sound natural (some sounds work better if very subtle. The master volume must be set to a level that adheres to in-house or broadcast standards (for example -6db). 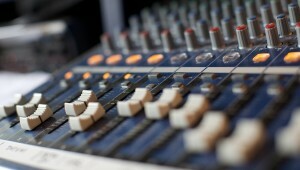 In the next few blogs we will specifically look at recording ADR, voice over, 5.1 and audio commentaries.